Most Pacific Missouri residents know a bit of our regional history--the coming of the railroads, and shortly thereafter, the establishment of the sand mines in town--of which U. S. Silica is the latest corporate incarnation. What is more obscure is exactly what those bluffs are made of-- and how they got here. 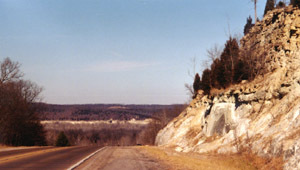 St. Peter sandstone, a 98 to 99% pure silica glass sand, is named for its type locality of St. Peter, Minnesota. It is sometimes a stretch to call it "stone". 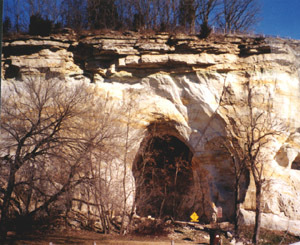 I recall as a child digging caves in a bluff face of St. Peter near Sand Cut Road halfway to Cedar Hill. Any rock that a twelve year old girl can break with her bare hands hardly seems worthy of the name. Although the deposit is very pure white here in town, if you go south, out Highway F to O, you will see a number of different colors staining the road cut at the top of the first hill. The pink, the green, the tan-yellow are all due to iron impurities in different states of oxidation--which is just a fancy term for rusting. According to geologists, the St. Peter sandstone was a prehistoric beach. You probably learned in school how limestone (most commonly seen around here as road cuts, building stone, and "chat" gravel) was laid down as sediments in a shallow sea which covered most of the Midwest United States. 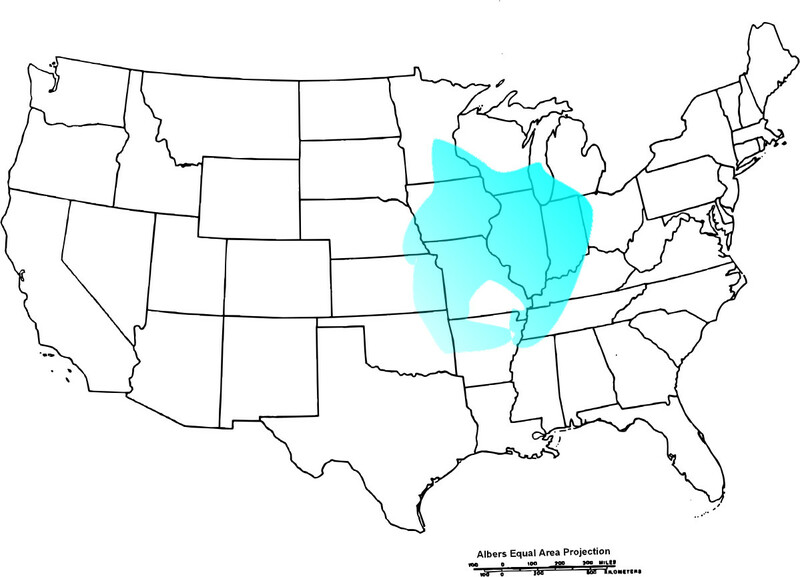 Map showing extent of St. Peter Sandstone in the U.S. To the south, this rock grades into the Everton formation, which contains more carbonates. Well, the St. Peter, stretching from Minnesota, down through Iowa, Illinois and Missouri was the beach to that shallow sea. If you look at the big pillars of sandstone remaining along Osage east of downtown, you can see a swirly grained pattern which almost looks like dunes. It's because that's exactly what the St. Peter is: petrified beach dunes, blown around by the wind. If you look at some of the sand grains under a magnifier, you will see rounded particles, with a "frosted" surface. That rounding and frosting only happens when wind bangs sand grains together, not water. 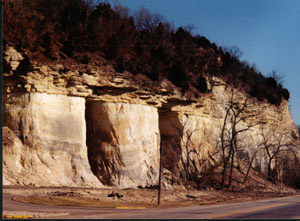 Outcrops of this rock first appear in Perry County, along I-55. The exposure comes north through Crystal City (that's what the city is named for), swings west near Hillsboro, then crosses near Cedar Hill, through Pacific, crosses the Missouri River near Warrenton, and is eventually buried by younger rock layers north of I-70 at Mineola. There is a huge block of St. Peter in the highway median just east of the Loutre River. The Graham Cave archeological site is a shelter cave formed in this rock. Exposures of the St. Peter are very narrow, only a few miles wide. We're lucky. We don't have to worry about how to save for vacation to go the beach. It's already in our own backyards. 2003 Blue Pentacle Press--a division of Geo Communications Services. Furnished for educational purposes only. For reprinting, please contact Jo Schaper at the link below. Back to the Missouri World Home Page.